An exhibition about the multiple meanings of a free place in the middle of Berlin. Berlin contains many wastelands, which are often conceived by urban planners and real estate developers as true waste. In their opinion, these spaces just wait for future developments. Berlin citizens, however, create meaningful places out of these abandoned spaces. The Cuvrybrache, well-known for the BLU mural paintings, is such a meaningful place. 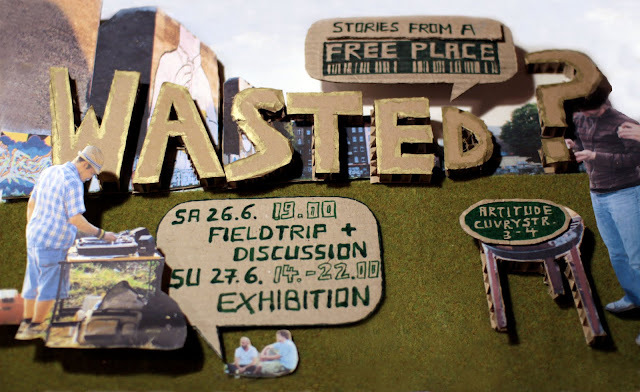 The exhibition “Wasted? – Stories from a free place” reveals the diverse meanings of this wasteland through photography and text. One of the current users rightly typified the area as playground for grown-ups. It’s a site to hang around with friends, grill, spray graffiti, start a guerrilla-garden, take your dog for a walk or just look at the Spree and dream away. As the wasteland has no concrete function since twelve years this spontaneous use is possible. Dutch Urban Researcher Jan van Duppen will introduce his work with a fieldtrip onto the plot. Then, different key-holders discuss the tension between the current use and future developments (offices, lofts and hotel). Afterwards one can play with the images and words of the current users. Try and grasp the feeling of free places like the Cuvrybrache. Berlin contains many wastelands, which are often conceived of as true waste by urban planners and real estate developers. In their opinion, these spaces just wait for future develop-ments. Berlin citizens, however, create meaningful places out of these abandoned spaces. The Cuvrybrache, well-known for the Blu mural paintings, is such a meaningful place. This research reveals the diverse meanings of the wasteland through a mix of research methods: observations, interviews, and photography. One of the current users rightly typified the area as a playground for grown-ups. It is a site to hang out with friends, barbecue, spray graffiti, start a guerrilla-garden, take the dog for a walk or just look at the river and dream away. This spontaneous temporary use is possible, because the wasteland has been lacking programming for the last twelve years. Analysis of conversations show that the temporary users value the wasteland as a free place, while it offers opportunities for diverse activities, contains alternative aesthetics, provides space to subcultures and, most impor-tantly, functions as a hang-out area near the river. Informal users have created a meaningful place that contributes to the liveability and diversity of the city. This socio-cultural value conflicts with the economic value of the Cuvrybrache as the land owner aims to realise offices, lofts and a hotel. Current temporary use is, thus, threatened by future developments, which are part of the neoliberal waterfront redevelopment plan Mediaspree.